Origin and Habitat: Crassula brevifolia is found from south-western Namibia through Namaqualand to Vanrhynsdorp (Northern Cape, Western Cape, South Africa). Habitat and ecology: Succulent Karoo, among rocks. Description: Crassula brevifolia is a much-branched shrublet 30-50 cm tall, with woody stems and old leaves deciduous. Two subspecies are recognized, the nominate form and the smaller Crassula brevifolia subs. psammophila. Stems: Stems subdichotomously branched. Branches green, round, 6 mm in diameter with intemodes visible between the leaves, Older branches woody, with reddish-brown flaking bark. Leaves: Very fleshy, connato-perfoliate, almost triangular and flattened in section, variable in shape, elliptic to linear-elliptic, (10-)20-35(-50) mm long, (2-)4-6(-18) mm wide and about as thick as broad, curved upwards abruptly constricted into to a blunt tip, spreading and bent upwards, glabrous, green often with a grey bloom, changing to yellow, red or purple, upper face flat to convex, lower face convex or keeled, tip acute, hydathodes on upper surface and margins. Margins horny at edge. Old leaves deciduous. Inflorescences: Terminal, rounded or domed, laxly few-flowered thyrses, the foliage usually passing gradually into bracts. Peduncle (3-)10-50(-80) mm long. Flowers: Lemon-yellow, rarely white, with a papillose ovary, and a pronounced, not at all pleasant honey-smell. Sepals (calyx lobes), connate, triangular, 0,7-1.5 mm long, rather thin, obtuse, ridged, somewhat fleshy, glabrous, green tinged red. Corolla tubular, fused basally for 0,6-1,2 mm, white to reddish tinged. Petals oblong-elliptic 3-4(-5) mm long, creamy-white or yellowish, rounded, erect or even strongly recurved at the tip, with or without a small mucro behind the apex. Stamens 2.5-4 mm long, attached to the short corolla-tube, about three-fourths the length of the petals Filaments white, subulate, anthers ovate, pollen black or yellow. Carpels greenish, about the length of the stamens, ovaries gradually passing into the short, slightly recurved styles, minutely scabrous all over and minutely ciliate along inner margin. Styles one third length of ovary. Squamae oblong to square, 0,6-0,8 x 0,5-0,9 mm, truncate, rarely emarginate, somewhat constricted downwards, fleshy, yellow to bright orange. Blooming season: Autumn (March to April). 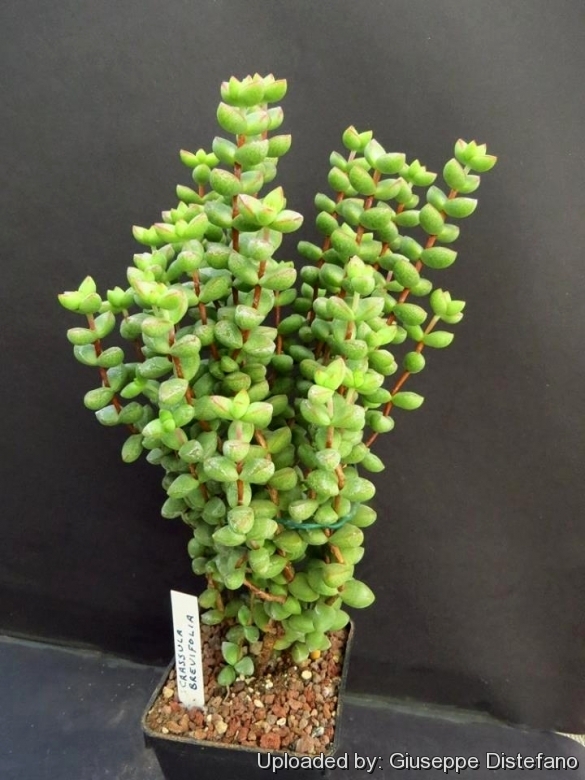 Crassula brevifolia Harv. : intemodes visible. Leaves 20-35 mm long, curved upwards, green with a grey bloom, changing to yellow, red or purple. Distribution: Namibia through Northern and Western Cape (South Africa). Crassula brevifolia subs. psammophila Toelken: smaller (up to 200 min high) the intemodes not visible. Lhe leaves are brownish-red without bloom. Distribution: Grootinis and the Orange River. 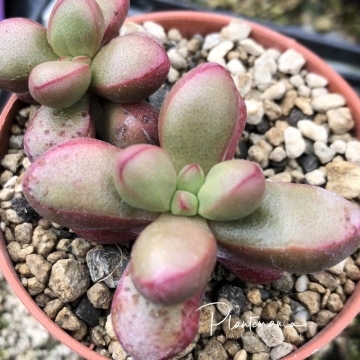 Cultivation and Propagation: Crassula brevifolia is a good beginner plant, fast growing, easy to propagate from cuttings and not prone to pests. It grows under a wide variety of climatic conditions provided it is planted in a well-drained situation given adequate water but not over-watered. They are often grown in bonsai pots and trimmed to appear as small trees. C. brevifolia plants will branch at the tips and can be used as a low, informal hedge. Watering: It needs moderate water – not too wet nor too dry from autumn to spring with regular water in summer (careful watering required in winter), fairly drought tolerant elsewhere. Exposure: It cannot take direct sun in summer but generally needs sun part of the day to bloom. In deep shade it gets pretty weak and leggy and eventually rots and dies. As house-plants, give crassulas up to 6 hours a day of sun. Maintenance: After growing for several years tends to become untidy resulting in thick tops and bare stems at the bottom. Without the pinching and trimming these succulent plants form new branches near the top. To encourage shrubbier growth, pinch off a few leafs at the top or restart it from cuttings. Propagation: Seeds/ Stem cuttings. Sow seeds in autumn. Place cuttings in clean river sand, mist every three to four days, roots should appear within 2-3 weeks.